In amongst our many enquiries we received this email today and it did make me chuckle! I have reserved off street parking and easy access to the back garden through a private gate. I have a small electric mower in the outdoor cupboard and an outdoor power point for any electrical equipment you may need to use"
Now you are probably thinking - that's not funny, that is a serious enquiry. Before anyone says, we have checked the ip address of this email and it is registered as being a spam ip address, so we don't feel bad for posting this enquiry here. The mobile number given was also incorrect. Well, the reason it made me chuckle was that bit that said I have a small electric mower in the outdoor cupboard You see, we have invested a lot of time and money in finding professional, petrol equipment for a range of situations and gardens and although electric mowers will have their place for domestic customers for us as a business they just don't cut it, excuse the pun! It really is beyond me why we get these kind of enquiries. What we didn't copy was the part of the email that says please don't call me, please email me and some other details which pointed to it being a scam. It really is beyond me why we get these very strange enquiries. We always respond professionally and often a written estimate and ask to talk with someone on the phone about the details further. Anyways we will use the opportunity to show case some of our grass cutting equipment and if you are in the Surrey or Sussex area around Crawley, Horsham and Dorking please contact us if you need regular lawn mowing. Ayegardening provides a reliable, honest and quality garden maintenance service in the Surrey and Sussex area. Please see Ayegardening 's website for more details. 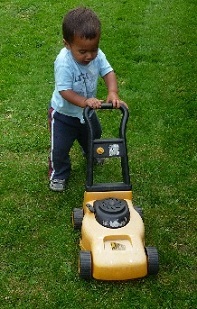 Well maintained, professional equipment is essential for a tidy, neat lawn!